In its ongoing exploration of Comet 67P/Churyumov-Gerasimenko, the Rosetta spacecraft captured this stunning silhouette of the two-lobed mass from a distance of 200 miles. Wow. The Philae comet lander may be dead, but its valiant mothership lives on. 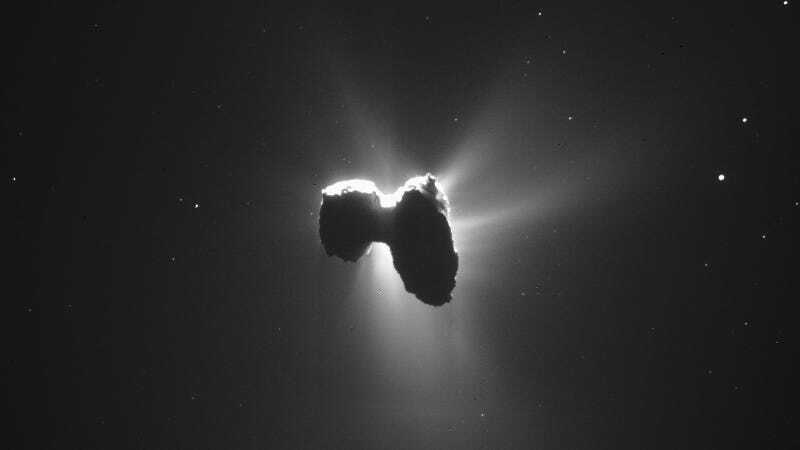 Rosetta recently ventured away from the comet to study its wider coma, tail, and plasma environment. At one point, when it was 200 miles (329 km) away, the spacecraft, comet, and sun aligned together at an angle of about 159 degrees. It was a perfect opportunity to take a picture. The top portion of the comet is brilliantly illuminated, but the dark patches reveal the comet’s freaky two-lobed shape. Scientists theorize that the comet got its shape in the wake of a gentle, low-velocity collision between two objects. Visual evidence shows that certain layers on the comet are oriented in different directions, which indicates that two objects fused to form a single, though oddly shaped, comet. Just to put the size of this thing in perspective, here’s what it looks like relative to the city of Paris. In other Rosetta-related news, the European Space Agency just released 984 new NAVCAM images of the comet taken between December 16, 2015 to February 9, 2016. You can check them out here.